The wood is cut up by my husband whose normal occupation is making handcrafted furniture. The base of the bottom screen is two inches tall. Years back I read that if a mite falls 2 inches or more it has a hard time crawling back up into the hive. Will it fall between 1/8″ wire? I doubt it, but I still do a two-inch base. Then nailed – yes, nailed. Then the wire is prepared. I use 1/8″ hardware cloth. It’s too small for bees and wasps to pass through, big enough for a mite and a lot of bee debris to fall though. That wire snip was an anniversary gift from me to my husband – romantic, eh? After a lot of cutting, I’m ready to attach the wire to the base. I staple it on with a stapler used for putting tar paper or tyvek onto the sides of houses. The staples don’t always go in all the way – that’s why there’s a hammer standing by as well. At this point I’ve got a 2-inch tall rectangle with screen on it. Now the top of the bottom screen needs to go on. It’s a one-inch by one-inch wooden rim that goes 3/4 of the way around the bottom screen, leaving a gap at the entrance. Once that’s on, I cut and put on the front “stoop”. Metal dry wall corner molds (I think, at least I get them in the dry wall section of the store), which are cut to the width of the front entrance. These too are nailed in place. Finally it’s done – no, not really…. 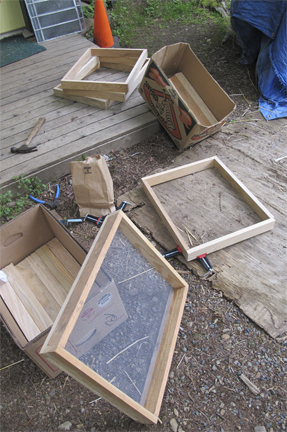 When the screen is flipped over, it becomes the base I use when moving single boxes of bees. The one inch side, in this case pointing down, allows for air circulation. The two-inch side, now pointing up, keeps the bees from leaving. I make a number of these at a time. They often, like this year, get placed into service before they are really done. As you can see from the above caption, we also make our own beehive tops. Back to screens: what these lack are the “hanger bolts” – these have screw ends on one side and threaded ends on the other. Then the outside and bottom of the screen is either painted or stained. I’m trying out an Eco Wood Stain that this year. Supposedly friendly to all creatures and the environment while protecting wood from wet weather. Will it hold up here? Who knows. But worth a try. That’s some of what’s going on at Brookfield Farm Bees And Honey right now. I’ve just finished doing my last group of splits for the year to accommodate queens arriving soon from Northwest Queens. That meant clearing areas for the new hives and making sure I had all the gear they would need. In the course I slated a few hives for walk-away splits that have grown way too tall. The queenless ones of those will be given some of the new queens. How is the bee season progressing in your part of the world. We continue to be unusually dry and warm. Nice, but worrisome – we do need the rain. This entry was posted in Beekeeping, Hive Components and tagged beehive, Beekeeping, bees, bottom screen, Brookfield Farm, how to make, Maple Falls, Washington. Bookmark the permalink.